This post was published just before 8:15am from my home at Indian Lake Estates, FL. Yesterday was a very relaxing one followed by another good night’s sleep. This post, which took me more than 5 hours to prepare due to an almost endless variety of snafus, marks 253 consecutive days with a new enjoyable and educational blog post. For information on mid-August Jamaica Bay Wildlife Refuge In-the Field Morning Sessions and the 2-DAY Nickerson Beach IPT click here and scroll down. This diagram maps out the five images that caught my eye on that fine morning. Note that I used the tall hill in the center as a major compositional element in each image that I created. 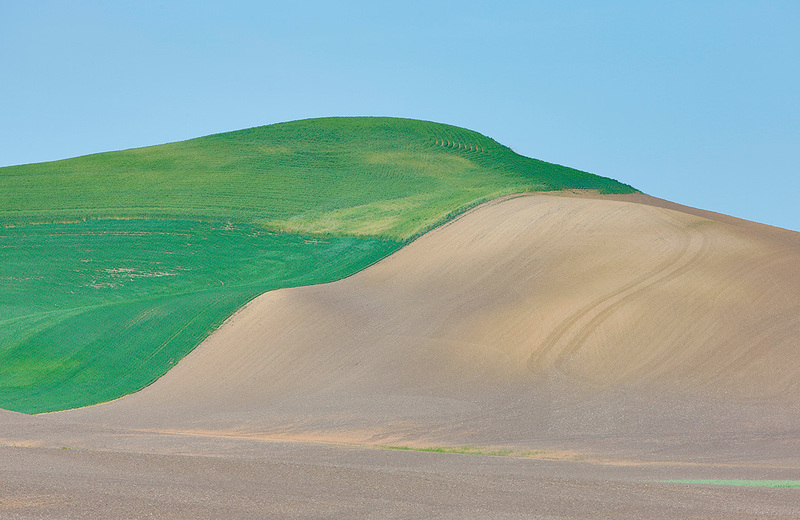 The lovely curved line that separated the green vegetation from the adjacent plowed field was quite sensuous. Read on for the details. Here is the challenge: click on the image above to enlarge it. Examine it carefully. You have access to all focal lengths from 70mm to 784mm in the form of a 70-200 II and a 200-400 with Internal TC along with an external 1.4X III. The latter covers from 200-784mm in its various configurations. What catches your eye? What images would you extract from the scene? Please leave a comment and please be specific. I will share several of the images that I created that morning with you in this coming Saturday’s blog post. Suggestions for creating pleasing blurs are of course welcome. Lots of folks left thoughtful comments that hit upon many of the interesting features in the scene. Below I share my four favorite images from that situation along with a digital creation of Image #4. . 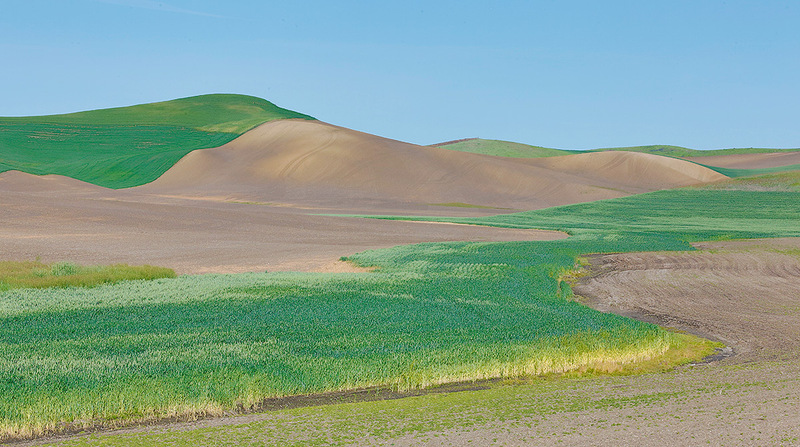 This three-frame Art Vivid HDR image was created on last June’s Palouse scouting trip with the Gitzo 3532 LS carbon fiber tripod, the Mongoose M3.6 head, Canon EF 200-400mm f/4L IS USM lens with Internal 1.4x Extender (at 200mm) and the Canon EOS 5D Mark III . ISO 400. Evaluative metering +1 1/3 stops +/- two stops around the base exposure of 1/60 sec. at f/22 in Av mode. Color temperature 4500K. Live View and 2-second timer. Central Sensor/Surround/AI Servo-Rear Focus AF on the near-corner of the blue roof and re-compose. Click here to see the latest version of the Rear Focus Tutorial. Click on the image to see a larger version. This was the first image that I made. 1-Why did I move so far to the left? 2-Why did I raise my tripod as high as possible? 3-What is the greatest strength of this composition? Clue: the answer to all three questions is the same…. 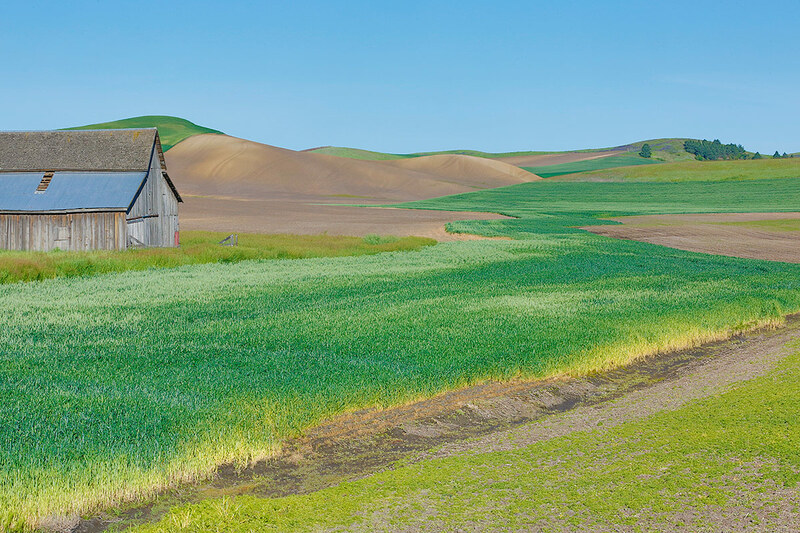 This three-frame Art Vivid HDR image was created on last June’s Palouse scouting trip with the Gitzo 3532 LS carbon fiber tripod, the Mongoose M3.6 head, the Canon EF 70-200mm f/2.8L IS II USM lens (at 95mm) and the Canon EOS 5D Mark III . ISO 400. Evaluative metering +1 stop +/- two stops around the base exposure of 1/40 sec. at f/32 in Av mode. Color temperature 4500K. Live View and 2-second timer. Central Sensor/Surround/AI Servo-Rear Focus AF on the nearest corner of the blue roof and re-compose. Click here to see the latest version of the Rear Focus Tutorial. Click on the image to see a larger version. 1-Why is Image #1 much stronger than Image #2? 2-Did I move my tripod at all after I created Image #1? This three-frame Art Vivid HDR image was created on last June’s Palouse scouting trip, this one with the Gitzo 3532 LS carbon fiber tripod, the Mongoose M3.6 head, Canon EF 200-400mm f/4L IS USM lens with Internal 1.4x Extender (with the internal extender engaged), the Canon Extender EF 1.4X III (at 552mm), and the Canon EOS 5D Mark III . ISO 400. Evaluative metering +2 1/3 stops +/- two stops around the base exposure of 1/80 sec. at f/16 in Av mode. Color temperature 4500K. Live View and 2-second timer. Central Sensor/Surround/AI Servo-Rear Focus AF on the curve lower left near the rule-of-thirds position and re-compose. Click here to see the latest version of the Rear Focus Tutorial. Click on the image to see a larger version. The sensuous curve in this, the tightest framing, caught my eye more than any single element in the wide scene. That is why I opted to include it in every image. This three-frame Art Vivid HDR image was created on last June’s Palouse scouting trip with the Gitzo 3532 LS carbon fiber tripod, the Mongoose M3.6 head, Canon EF 200-400mm f/4L IS USM lens with Internal 1.4x Extender (at 400mm) and the Canon EOS 5D Mark III . ISO 400. Evaluative metering +2 1/3 stops +/- two stops around the base exposure of 1/250 sec. at f/11 in Av mode. Color temperature 4500K. Live View and 2-second timer. Image #3 is the tight view. Image #4 is a wider view. 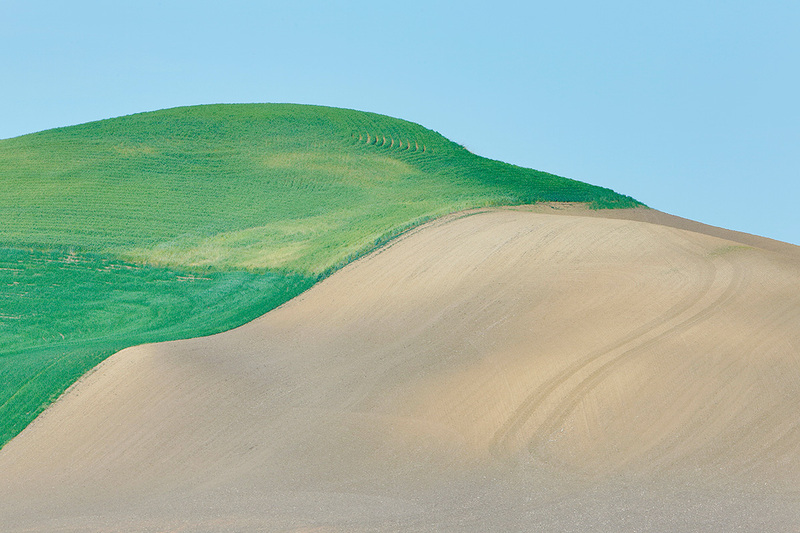 Image #3 offers the greatest detail in both the green vegetation and the plowed dirt field. Image #4 features much of the same plus a thin green strip in the lower right. Which of these two images do you like best? Why? 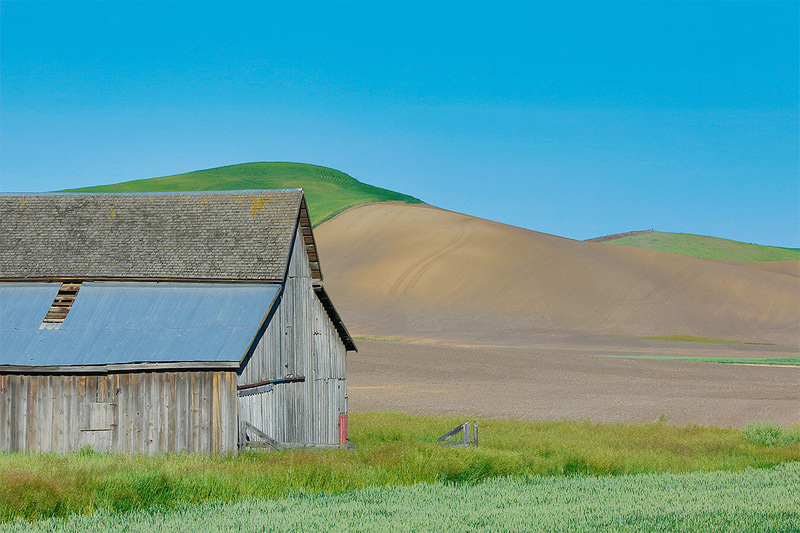 This three-frame Art Vivid HDR image was created on last June’s Palouse scouting trip with the Gitzo 3532 LS carbon fiber tripod, the Mongoose M3.6 head, the Canon EF 70-200mm f/2.8L IS II USM lens (at 125mm) and the Canon EOS 5D Mark III . ISO 400. Evaluative metering +1 2/3 stops +/- two stops around the base exposure of 1/60 sec. at f/22 in Av mode. Color temperature 4500K. Live View and 2-second timer. Central Sensor/Surround/AI Servo-Rear Focus AF on the apex of the green curve on the lower right and re-compose. Click here to see the latest version of the Rear Focus Tutorial. Click on the image to see a larger version. This image was cropped from below to a pano. Note the inclusion of the complete curve of green vegetation that was missing in Image #2. Why were all of the HDR Art Vivid images presented here created at Color Temperature 4500K? Image #6 was created from Image #5 (immediately above) in Photoshop CS-6. Keep reading to learn how. Image #6 was Created in Photoshop from Image #5 using Filter/Blur/Motion Blur and then adjusting the Distance slider to about 75. Though I created more than a dozen pleasing blurs of the area in Image 5, the Photoshop-created version was my favorite by far. Take a moment to leave a comment and let us know which of the six images here is your favorite and why. Card and design by Denise Ippolito. 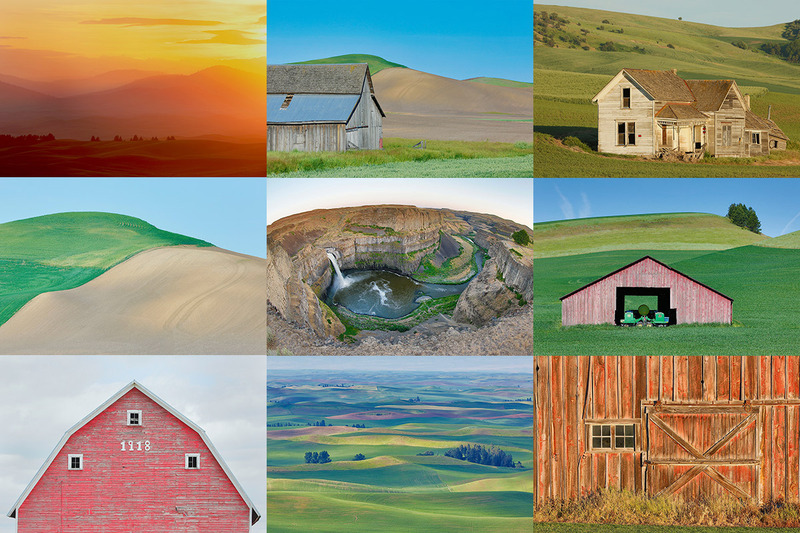 Scroll down here to see lots more of Denise’s Palouse images. Note that the dates on Denise’s card are for the first Palouse IPT that is sold out with a long waiting list. The dates for the 2nd IPT are June 5-9, 2015. See below for complete details. As the trip above sold out quickly and now has a long waiting list we scheduled a second trip after giving ourselves 2 days to recover from the first one. 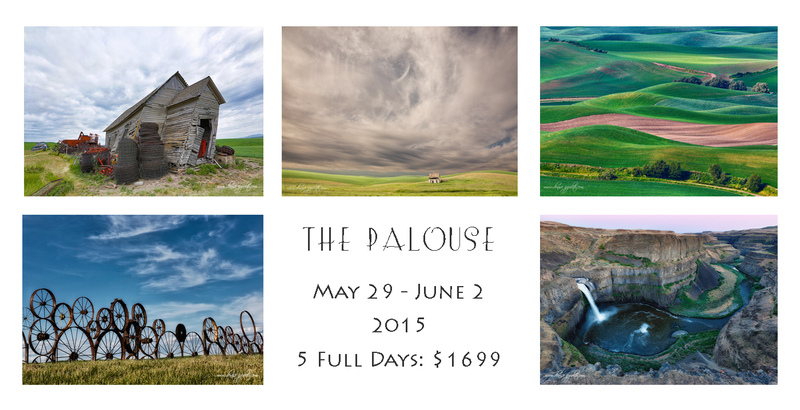 We have already sold eight slots for the 2nd Palouse trip so please do not tarry if you wish to join us. There will not be a third trip. 🙂 See the details below. Please note that there are two Palouse IPTs in place; the first has been sold out with a waiting list for some time. We hope that you can join us for IPT #2: Card and design by Arthur Morris/BIRDS AS ART. The Palouse A Creative Adventure/BIRDS AS ART Instructional Photo-Tour (IPT #2)/Eastern Washington State. June 5-9, 2015/5 Full Days: $1699/Limit 12 photographers/Openings 4; this trip is a go. 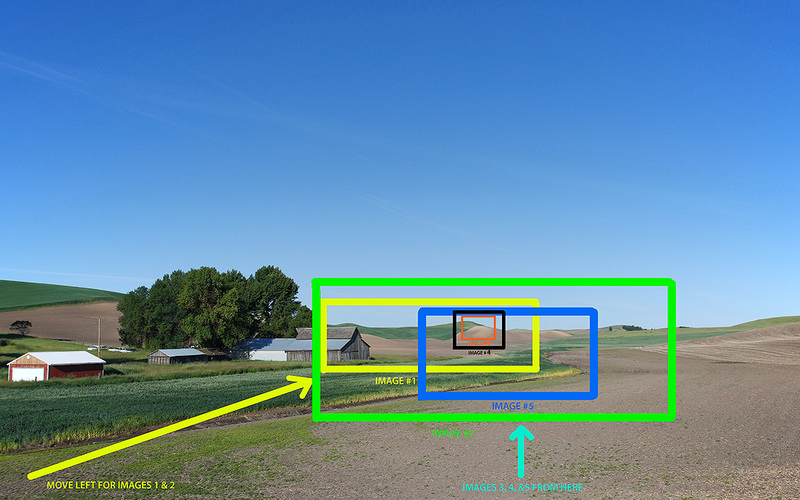 Answer to questions about image 1, moved to the left to include part of the barn on the left side of the picture, had the max height of the tripod to capture the barn from as high as possible. Strength is the line of the roof intersecting with the line between the green and brown on the hill. My daughter just spent 5 years as a student at WSU in the heart of the Palouse. Ergo, I spent quite a bit of time there also, climbing Kamiak Butte, etc. It is truly beautiful countryside and everyone is going to love the beauty of it. My favorites are #1 and #3. #i because I like old barns and like the straight lines of the barn with the hill’s curving lines behind it, and like the narrow strip of green mid-right. That strip and the far right hill seem to balance the barn. #3 has such beautiful curving lines. When I looked for lines making triangles etc. I suddenly saw a big green bird with bill pointing right and a light colored oblong eye and light colored throat, and light eyeline made by crop rows. Even though I liked the thin green line on the right in #1, in #4 is pulled my eye from the curving lines. Image No 5 looks like you had one too many at lunch time, Artie. I really must stop drinking before lunch. Do you think being sober would improve the appearance of No6?